VMware vRealize Operations Manager 6.6 provides us with a new HTML5 based user interface that allows quicker navigation through persona based dashboards, the new dashboard getting started page gives us some useful categories of dashboards like Operations, Capacity and Utilization, Performance Troubleshooting, Workload Balance, Configuration and Compliance to help us getting started. Now that we have seen the various categories of dashboards available let’s go ahead and see the various options available to us in each of these categories. Give us an overview about Datastore Usage that identify which VM’s have the highest storage IOPS and latency, Host Usage identifies which ESXi host have the Highest CPU demand and active consumed memory, Operations Overview provides us an overview of entire environment and give us an insight about VM having performance issues, Optimize VSAN Deployments compare the performance of your VSAN and non VSAN environment’s and look for opportunities to migrate VM’s over the VSAN Datastores, VSAN Operations Overview – Give us an overview of our entire VSAN environment and understands which VSAN Cluster may have performance issues. Give us an overview about Capacity by giving the information about how much capacity left, how much capacity has been consumed and what was the usage trend for vCenter, Clusters. The capacity and utilization tab also give us VSAN Capacity Overview along with savings gained by enabling deduplication and compression, another dashboard option available under capacity and utilization is Capacity Reclaimable which calculates how much disk space, vCPU and Memory can be reclaimed from monster virtual machines, few other options that are made available under capacity and utilization talks about VM, Host, Datastore, Cluster utilization and Heavy hitter VM’s. Give us a guided workflow to troubleshoot a cluster, datastore, ESXi host, Virtual Machine, VSAN and helps us to troubleshoot with logs by reviewing the log insight dashboards. Helps us to understand and manage Virtual Machines workload balancing between clusters and to adjust DRS settings, it gives us the information about whether the clusters are balanced or not, what is the vMotion trend, DRS settings and current workload and provides us the information about Capacity Utilization of Datacenter resources. Provides us an overview about Cluster Configuration, Host Configuration, VM Configuration, Network Configuration, and helps us understand if our environment is configured as per the vSphere Hardening Guide. 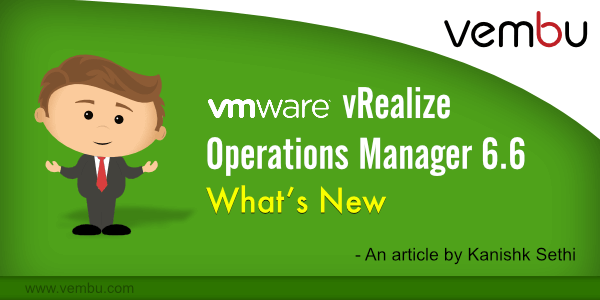 In this article we have seen all the options available to us on this new dashboard getting started page and how these dashboards helps us in getting started, will be dedicating another article talking about some more features that has been added in VMware vRealize Operations Manager 6.6.